You watch as your morals and culture is ripped apart, and you just sit there and pray to singularity and say "don't worry muh god ai president in the future will save us all!!!! democratic united world!!!! yeah, we will cure and fix everything with science!!!" Now it is clear that I do not belong on this forum, I lost all my futurist interests a long time ago, but you need to understand, Science can not and will not solve everything, we can't just hopelessly throw all our problems in the trash and say "Oh Science will solve them, if only we cut funding for everything and put it all in Science, we'd be living in the singularity now!" Exactly my thoughts. Not that "I lost all my futurist interests", but i clearly do not belong to this new "singularian" quasi-religion with its own set of saints like Bill Gates or Elon Musk. Nor i care about stillborn idea of "united democratic world" populated by bright-minded, nationless, gender neutral individuals. The great irony is that these "progressives" may consider me "backward" and "outdated", but can not notice that this is exactly they and their ideas no longer reflect the spirit of the times. I'm sorry caltrek, I misinterpreted this reply, I thought you mean I should check which one of these needs I was missing, I took that as an insult, now I understand that you were talking about the needs of the disabled people. You were focused on meeting physiological needs - at the base of the period. These are first and primary. Once these needs are met, other needs come into play. Including belongingness and love needs. In their capacity to give and receive love, the handicapped can help us all in meeting such needs. Success in dealing with their handicaps can also help build the prestige of not just the handicapped, but those who help them to overcome their handicaps. 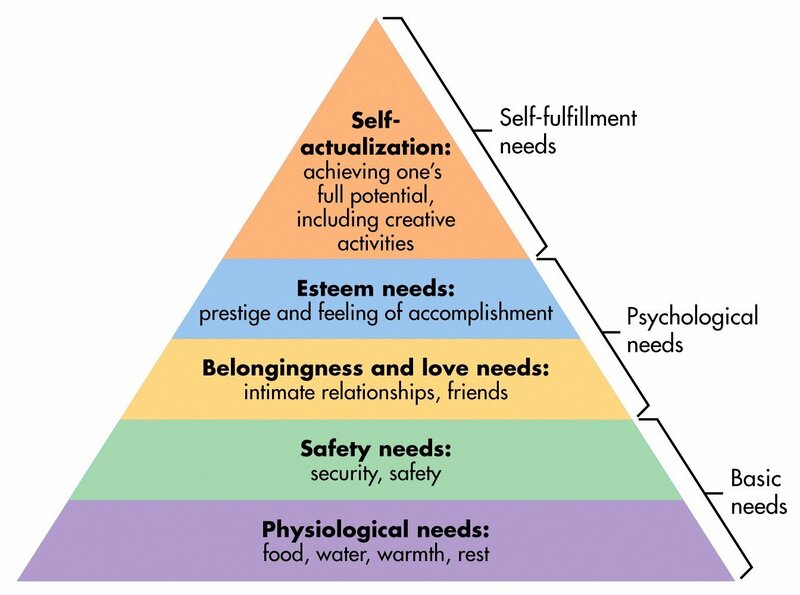 If you analyze everything in terms of the primary physiological needs, you will miss the higher needs that all humans feel. If you yourself are having serious problems meeting your primary physiological needs, then perhaps you yourself need help in that regard. This can only be taken as an insult if you are unwilling to acknowledge that you yourself are not having your primary needs met. IQ is not influenced by education is It? That's why there can be really stupid people who know nothing with high IQs, while there can be people with low IQs who know more than someone with a higher IQ, IQ is a measure of how much Intellectual Potential and Pattern recognition a person has, it is only effected by Malnutrition, or the intake of drugs which damage the Brains mental capacity, IQ is also a great factor which determines how fast or how slow someone can learn something, it is significantly harder to learn something if you have a lower IQ. The South African nation has an average of 77, it is presumably the most developed country in South Africa, it has a low malnutrition rate and the school system is on a Western level, so why is it's IQ so low? Arguing with you Americans is actually impossible in the case of Eugenics or Scientific Racism, you've become so brain washed with your "All Men are Equal", "Human Right to Reproduction", these Rights are not observed in nature at all, mother nature does not care about your Human rights, they are fundamentally ignored. The notion of a human having a right just because he was born is stupid, people have to work towards their "rights", they should really be called privileges. I've heard that some people want to make The Internet and Abortions into human rights, why? Where's the line? Where do you draw the line between right and privileges? If we just continue adding "Human Rights" to the list, they will become useless, when everything is a Human Right, nothing is, you take away the speciality of the situation. Imagine if the right to internet was made a human right, what for? Are you Americans going to denounce countries in the UN assemblies just because they don't provide good internet speed to their people? No, the notions of human rights are completely against nature, and they are bound to fail, in the quest for "equality" and "peace" you Americans have ignored the rules of nature, do you ever wonder why your nation is in so much pain? You watch as your morals and culture is ripped apart, and you just sit there and pray to singularity and say "don't worry muh god ai president in the future will save us all!!!! democratic united world!!!! yeah, we will cure and fix everything with science!!!" I hope you all have to endure the "pain" of another Trump term (and then hopefully Joe Biden after Trump serves his 2 terms), farewell. well, we seem to have driven him off. Whatever, he was young, and his morals were skewed. Hopefully he'll return at a later date, with a more intelligent viewpoint. If he does see this post, however, i would encourage him to read this PDF that states that through studies, it has been shown that education during adolescence does in-fact significantly raise IQ. Just because you google something, and it says one thing does not mean it is correct, sometimes you have to look deeper. Yeah jingoism isn't really compatible with the "spirit of the times". On a brighter note one of Pisiu's comments does open the door for a discussion on substantive rights. This comment of his, "The notion of a human having a right just because he was born is stupid." I beg the question, if you cannot claim a right, do you even have it? What makes a right real? This is what I meant when I said bombarding Pisiu for his beliefs won't accomplish anything but mutual frustration. Nobody here was going to become a fascist because of him. No harm could have come from his presence and now he is gone. In that last flurry of frustration, he did actually say something of value. To answer my own question about rights. No, if you cannot claim a right you do not actually have it. What do I mean by claim? Let's say you have the right to freely travel across borders, and your passport guarantees this. Let's also say you don't have enough money to buy a passport. Since you can't actually cross any borders you don't have the right to travel, it is a farce, only in name. The same goes with representation. Can you pay enough to lobby effectively? If so, congratulations you will be represented fairly in your government. If not, you likely won't be represented. In this sense, if you're not rich, you don't have the right to representation, at least not in the same capacity as someone who is wealthy. One more example. Let's say you have the right to an abortion, but there are only two clinics in the state and you're too poor to own a car and live in a public transit desert and those two clinics are on the other side of the state. In this case, the state legalizes the act of abortion, but you can't actually get one. Once again, you don't have that right because you can't claim it. The right is only given in name, nothing more. Since we agree that the state should uphold our rights, but as illustrated above often only does on paper. It is fair to say that we need a new infrastructure for claiming and guaranteeing our rights, otherwise we don't actually have them. And no, just reforming states to magically guarantee rights doesn't work. We've been attempting that for the past four centuries. We need a new form of social contract. You could also take Pisiu's angle and say they don't exist, but that's false. Rights do exist if they are enforced, the act of enforcement makes them real.